Metal is resistant to a wide variety of environmental factors, able to hold a great deal of weight and is still fabricated into many different forms when heated. Steel, aluminum and titanium are the three main types of metal materials used to construct storage racks, which generally consist of vertical and horizontal rods or beams, a series of decks and supporting rods. Metal Storage Racks – Ridg-U-Rak®, Inc. The major components of metal storage racks are either bolted or welded together and have very long life spans, even when under constant strain. While wire storage racks are often used inside the home and office, metal storage racks are common in industrial settings because of their strength, durability and ability to hold a high amount of pounds per square inch (psi). Their specifications include width, height, depth, material used, surface finish and number of levels, which can exceed 5. Many variations are adjustable, while others are designed to fit certain items like pallets or long parts like wooden posts or metal rods. 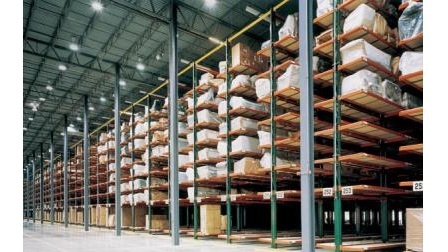 Metal storage racks are used to hold materials, tools, equipment, parts, finished products, boxes, trays and packaging materials in many different industries, including the food and beverage, restaurant, pharmaceutical, tobacco, metal fabrication, grocery, storage, shipping and electronics industries, among many others. There are many different types of metal storage racks. Some are manufactured with a wire deck, which is either interwoven together or welded at cross points and are very light in weight yet strong. They are used when high visibility of the stored items is needed. They also prevent dust build up and are easy to clean by spraying down. Some storage rack systems are set at an incline, which allows a FIFO (first in, first out) or LIFO (last in, first out) method of picking. These generally store pallets or large boxes/crates and use gravity to increase the density, thus saving space and making it easier for forklifts to access the front load. Some of these rolling racks are equipped with a series of metal roller conveyors, while others merely use straight, smooth tracks and gravity to force the loads towards the front. Storage racks are often loaded with a forklift in either the front or back, and the picking is generally done in the front. There are many different setups to choose, depending on whether the rack system is static, meaning non-moving and permanent, or mobile and on wheels or a set of tracks. Mobile storage racks tend to take up less room and are more efficient because they require less aisle space than static systems. Metal Storage Racks Metal storage racks are popular systems for organizing and storing unused items in warehouse racking systems.